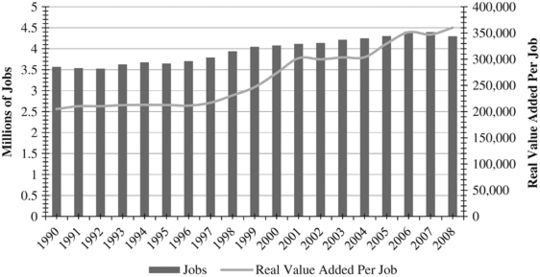 This paper examines the evolving structure of the American economy, specifically the trends in employment, value added, and value added per employee from 1990 to 2008. Employing historical time series data from the Bureau of Labor Statistics and the Bureau of Economic Analysis, US industries are separated into internationally tradable and nontradable components, allowing for employment and value added trends at both the industry and the aggregate level to be examined. 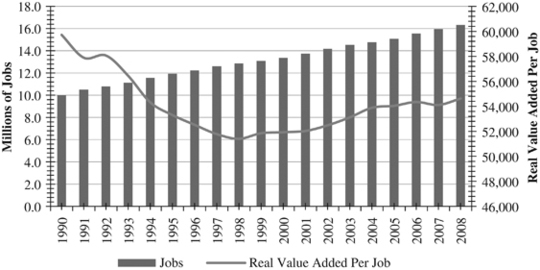 Value added grew across the economy, but almost all of the incremental employment increase of 27.3 million jobs was on the nontradable side, where government and health care are the largest employers and provided the largest increments (an additional 10.4 million jobs) over the past two decades. There are obvious questions about whether those trends can continue; without fast job creation in the nontradable sector during this period, the United States would already have faced a major employment challenge. The nontradable sector also experienced much slower growth in value added per employee; because value added per employee is highly correlated with income, it goes a long way to explain the stagnation of wages across large segments of the workforce. The evolution of the US economy supports the notion of there being a long-term structural challenge with respect to the quantity and quality of employment opportunities in the United States. In the post-crisis environment, issues of sustainability in the trajectory of the US economy have come to the fore.1 Among the problems pointed to are a large current account deficit, the paucity of household savings, overleveraging in the financial and household sectors, and the stagnation of middle-class incomes. However, what appears to be missing is a detailed look at the structural shifts in the economy over longer periods, and the way in which emerging economies’ growth patterns are affecting the pattern of industry employment and value added in the United States. This paper attempts to close the gap, offering a fresh look at the US economic structure over the past 20 years and exploring the implications of such shifts. Employment growth in the US economy between 1990 and 2008 was substantial, on the order of 27.3 million jobs, off a base in 1990 of 121.9 million. Virtually all (97.7%) of the incremental employment stems from the nontradable sector. This occurred despite dramatic labor-saving technology in information processing that ran across all sectors of the economy. The leading employment sectors are government and health care, in that order, both on the nontradable side. Together, these two sectors generated more than 10 million additional jobs over the period, accounting for almost 40% of the increment. The tradable sector accounted for only a negligible number of new jobs due to gains in service industries (eg, finance and consulting) being offset by losses in manufacturing and agricultural employment. Manufacturing sectors that suffered a loss of employment also experienced rising value added. Therefore, value added per job rose, in some cases dramatically. High-income jobs remained in the tradable sector. For the tradable sector as a whole, value added per job rose substantially, an increase of 54.9% from 1990 to 2008, far above the increase of 23.5% in the economy as a whole. The tradable sector is gravitating toward higher value-added components of global supply chains. These consist, in broad terms, of high-end services, some in manufacturing industries and some, such as finance and insurance, in pure service industries. Notably, and in contrast to employment trends, the nontradable sector saw growth in value added per job of only 13.9%, far below the tradable sector's 54.9% increase. One implication of the mismatch between sectors driving employment and sectors driving value added per job is that income inequality has increased and is likely to intensify in coming years. Until the crisis of 2008, the US economy did not have a conspicuous job crisis due to the ability of the nontradable sector to continue to absorb entrants to the labor force. In our view, it is unlikely that this pattern will continue. The pace of employment generation on the nontradable side will slow. Fiscal constraints, the costs of the health-care sector, a resetting of real estate values, and the elimination of excess consumption all point to the potential for a longer-term structural employment problem. Given the prospect of slowing employment growth in nontradables and rising competitive pressure on tradables, major employment problems in the near future are a certainty. Even if the nontradable sector was able to continue to absorb the growth in the labor force, pressure on wages and salaries will be downward, and consequences for income distribution unavoidable. To create jobs, contain inequality, and reduce the US current-account deficit, the scope of the export sector will need to expand. That will mean restoring and creating US competitiveness in an expanded set of activities via restrained pre-tax income and wage growth, as well as heightened investment in human capital (including skills upgrading), technology, and hard and soft infrastructure. The challenge is how to do it most effectively. Rather than intervening directly in market dynamics, we suggest that government try to shift incentives at the margin by investing in both physical and human capital to encourage an expansion of manufacturing and high-tech activity. Otherwise, the United States will have a longer-term employment problem. The American economy does not exist in a vacuum; some of its most striking and evolving characteristics are tied to long-term trends in the developing world, namely, the large emerging economies. The first section describes the evolving structure of the global economy and offers perspective on how emerging economies have increased their influence on the US economy since the early 1950s. The next section describes the tradable and nontradable parts of the economy. The main body of the paper is a detailed and data-intensive look at changes in employment and value added in US industries. The paper concludes with an assessment of the structural and employment challenges and begins a preliminary exploration of possible policy responses. 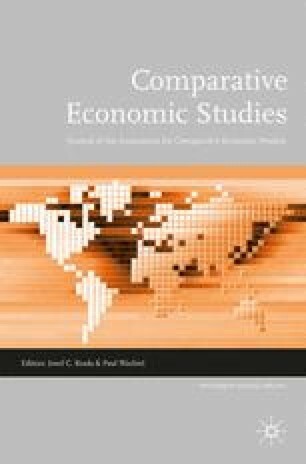 For readers who are interested in the major trends and findings, but not industry-level detail, we suggest reading the next section on the evolving structure of the global economy, then, near the end, the last two sections, which discuss policy responses that may help shift the trajectory. Finally, for those who wish to see an extended version of the paper, which includes more detail on the intertemporal dynamics of the US economy, see Spence and Hlatshwayo (2011). In order to put the structural changes of the US economy into context, it is necessary to understand the dynamics of the global economy in the postwar period, particularly with respect to developing countries. Since the end of World War II (WWII), the establishment of important institutions such as the International Monetary Fund, and successive rounds of negotiations targeted at liberalization, starting with the General Agreement on Tariffs and Trade (GATT) in 1947, the global economy has steadily increased its trade and financial openness. In parallel, colonialism, with its inherent constraints on economic development and its built-in asymmetries, collapsed. Although 200 years behind the advanced countries, whose growth accelerations began in the late eighteenth century with the British industrial revolution, developing countries across the globe began a century-long process of modernization after WWII. We are slightly more than halfway through that century. As formal barriers to trade and capital flows declined, a number of other trends combined to accelerate growth and structural changes in the developing economies. They included advances in transportation and communications technology, management innovation in multinational companies, a process of learning about doing business in multiple and diverse environments, and the integration of multinational supply chains. Thanks to information technology (IT), services formerly in the nontradable part of the economy, from radiology to accounting, have become tradable. Large emerging economies, with varying starting points (and many false starts), have accelerated to sustained growth rates, often exceeding 7% a year. After several decades of high-speed growth, these economies have become larger and richer. With increases in size, the shifting structures of emerging markets have larger impacts on the structures of advanced countries. Growing emerging economies shift to higher value-added components of international supply chains as physical, human, and institutional capital deepen and they then begin to compete directly with rich economies. In the early part of the postwar period, as successive rounds of the GATT agreement removed restrictions on manufacturing exports, developing countries – whose exports consisted mainly of natural resources and agricultural products – expanded into labor-intensive and lower value-added manufactured goods. Textiles and apparel production were prominent. Other industries were added as time progressed. The list is almost endless: luggage, dishes, cutlery, toys, personal products and so on. But it was not just finished products that were added to emerging economy portfolios. Labor-intensive and relatively low value-added parts of global supply chains moved to emerging economies as multinational companies progressively learned how to integrate geographically dispersed operations efficiently. In consumer electronics, the labor-intensive assembly process is a natural fit for lower-income countries. Semiconductors, circuit boards, and other components are designed and manufactured elsewhere, namely, in high-middle-income countries such as South Korea. Branding, marketing, and research tend to be done in rich countries. Each component of the supply chain has its most cost-efficient location. The shape of global supply chains is constantly shifting. Countries enter and engage with the global economy at different times and expand at different rates. Late arrivals to industrialization tend to follow the same path as earlier ones.2 The early high-growth economies – Japan, South Korea, and Taiwan – initially exported labor-intensive products, then graduated to more capital-intensive products such as automobiles and motorcycles, and then to human capital-intensive activities such as design and technology development. The labor-intensive activities, which these early high-growth markets exited as their costs of labor rose, moved to later arrivals in the global economy, predominantly Asian economies such as China and Vietnam. The shifting global structure is not static, cyclic, or mean-reverting. It is best described as a journey that will only be taken once. It is our role as academics to accurately describe that journey and to use this knowledge to help direct the US economy in the most equitable and competitive direction. In the global economy, some goods and services trade internationally and some do not. The tradable sector consists of the goods and services that can be produced in one country and consumed in another, or as in tourism or education, consumed by people from another country. The nontradable sector is the set that must be produced and consumed in the same country. Examples of tradable goods and services include most manufactured products, many agricultural products, a growing set of business and technical services, minerals, energy, and gas. The nontradable industries include government, retail, health care, construction, hotels and restaurants, most legal services and so on. The boundary between the tradable and nontradable sectors is not fixed. Twenty-five years ago, business services such as IT maintenance and support were not traded internationally; now Internet connectivity and innovative software permits many of these services to be performed remotely at lower cost, often in another country. Over time, cross-border specialization and learning brings higher quality and efficiency as well as lower cost. Tradable and nontradable parts of the economy also do not line up perfectly with conventional industry definitions. The latter are groupings of industries based on final products. Some of these products within a particular grouping may be tradable internationally but others are not tradable. For example, most legal services are not tradable internationally, but a subset dealing with international business and financial transactions are. But far more important than the comingling of tradable and nontradable products within an industry group is another phenomenon altogether. A good or service is produced and delivered to the final consumer in a series of steps called the value-added chain. Total value added is defined as the final sales of a company or industry less its purchased inputs (excluding labor and capital). Purchases would include services such as legal services and accounting services, as well as parts and components made by other industrial sectors (or companies), and raw materials, energy and the like. The idea is that labor (of all kinds, including management) and capital combine to add value to the purchased inputs, and that value is reflected in the sales value of the final output. If the final output (a good or service) is not sold, as in the case of most of government, there is no market mechanism for determining value of output. The final output is then taken to be the total cost of labor, capital (annualized) and the purchased inputs, including intermediate products and services. The idea is that the democratic collective choice mechanism that replaces the market works reasonably well and incurs these costs because the society places at least this much value on the services that are delivered. Of course, one can, and people frequently do, question that. But, in any case, that is the value-added calculation for services that are delivered but not sold. To illustrate what a value-added chain might look like, imagine that we are planning to launch a new electronic product. From initial design to store sales are a multitude of steps that must be taken, each of which can be broken down into smaller steps and processes (see Figure 1). In sum, these steps form the value-added chain. The value added for the final product would be the retail price (complete with markups) less all the costs that went into getting it into the consumer's hands (excluding labor and capital). The details and number of steps vary across industries. When viewed this way, manufacturing, in the sense of production of a commodity, is not a single industry. It is a subset of the steps or stages in the value-added chain, and often for complex products, such as autos, more than one stage. Complex value-added chains usually include both tradable and nontradable components. Just as industry data do not capture these complexities, trade data also have shortcomings. An iPad shipped from Foxconn in China has value-added components from the United States and several countries in Asia embedded in it. Without a large amount of supplementary information, it is effectively impossible to track back from the consuming country to find the locations of the creation of value added for a particular product. For perspective on the complications associated with pinning down value added for the iPhone, see Xing and Detert (2010). Moreover, the value-added chains for final products can overlap. Some parts of the chain are specific to the particular product (assembly, for example), whereas others can be shared (component parts or logistics or back office functions). The global economy does not divide neatly into totally separate value-added chains with one for each industry or class of final products. Part of the tradable sector is a set of functions that involve information processing and services related to them. These sectors have been the subject of numerous studies and much attention. Important technological innovations have enabled labor savings, information processing, and transactions automation. In addition, some of these functions have been outsourced. The evidence thus far appears to favor the conclusion that much of the employment reduction has been the result of labor-saving technology rather than of outsourcing. However, some analysts confuse these sectors with the entire tradable sector, and conclude that globalization has had relatively small impacts until now. The premise is inaccurate and the conclusion false. Information processing and related services are a small, growing part of trade. It is interesting, relatively new, and the studies are useful. But one should not draw broad conclusions about the impact of the integration of global markets from analyses of one relatively small part. As we shall shortly see, employment is declining in manufacturing and rising in finance. Both groups outsource and offshore information services; but to conclude that the manufacturing employment decline can be attributed to an unusually large amount of outsourcing in information processing for manufacturing is simply incorrect. To summarize, the best way to think about the tradable sector of an economy is to define it as the set of activities that can form part of global supply chains. At this stage, we have data on industries. So, as a first approximation, we will classify goods and services (that is, industries) proportionately as tradable and nontradable depending roughly on the tradable proportion of the value-added chain (using value added as the measure). The structure of the American economy is evolving. Technology is one of the driving forces, both domestically and in integrating the US economy with the global economy. The domestic economy does not operate in a vacuum. In a relatively open global economy, structural change in emerging economies causes structural change in advanced countries. When a certain kind of activity declines in our economy, normally it does not just disappear from the global economy, but instead moves to another location. These powerful market forces operate directly on the tradable sector, and indirectly on the nontradable portion through wage and price effects and shifting opportunities in labor markets. To divide the economy and its component industries into the tradable and nontradable parts, we used a methodology developed by J. Bradford Jensen and Lori Kletzer (2005). Their approach determined the tradability of an industry domestically, based on its geographic concentration – the more concentrated the industry, the higher its tradability (and vice versa). For example, take retail trade: its ubiquitous geographic presence implies that it is highly nontradable. The same could be said for dry cleaners, construction, and most health care. On the other hand, mining tends to be geographically concentrated, which points to its tradability. Jensen and Kletzer's classifications reflect domestic tradability more accurately than international tradability. For instance, in legal services, domestic tradability and international tradability diverge. We adapted and adjusted their classifications by critically looking at each industry's tradability estimate and using both common sense and export and import data to see whether their proportions reflect industries’ international tradability. Generally, the divisions seem correct, certainly close enough that the larger picture of structural evolution would not be misleading. The details of the methodology and sources of data are described in Appendix A. Many industries are entirely tradable or nontradable, though in most industries there is a growing set of service components that are in principle tradable. We look at the shifting structure of the US economy from 1990 to 2008, just before the crisis. We examine employment and value added overall and by industry, evaluating the trends in the tradable and nontradable sectors. Then combining the two, we look at value added per person (VAP) employed, a number closely related to income.3 When analyzing the data, we paid attention to both growth rates as well as levels of the various indicators over time. While uncomplicated, methodologically speaking, once split into their tradable and nontradable portions, the industry-specific data uncover new insights about where the US economy has come from and where it is going. Between 1990 and 2008, jobs have seen a net increase of 27.3 million on a base of 121.9 million in 1990. Hidden by this figure is a multitude of differing employment trends across industries; the figures reported here are the net amounts. Almost all of those incremental jobs (26.7 of 27.3 million) were created in the nontradable sector. In the aggregate, tradable sector employment growth was essentially flat: some industries grew and others declined, and within the period considered employment rose for about a decade and then fell back to its 1990 starting level. As is clear in Figure 2, the nontradable sector is large, and, in terms of share of total employment, became larger over time. In terms of total changes over the sample period, the tradable sector saw a net increase in jobs of less than 1 million (Figure 3). The large nontradable sectors are government, health care, retail, accommodation/food service (ie, hotels, restaurants, and hospitality), and construction. In 2008, these accounted for 73.5 million jobs, 64% of employment in the nontradable sector and just under 50% in the economy. Together, the top five nontradable sectors contributed 65% of the total increment in jobs from 1990 to 2008 (see Table 1). Table 1 includes nontradable components of industries such as finance and insurance, even though most of these industries are tradable. To ensure that the data are viewed in context, industries that are not predominantly or entirely nontradable are noted as such. We have no way at present of isolating employment growth or the decline in the tradable and nontradable subcomponents of an industry that is a mixture. We therefore simply allocate the increase or decline in employment (or later value added) to the tradable and nontradable parts based on the fraction of the industry estimated to be on each side.4 This is unlikely to be accurate, at least for declines; declines are more likely to occur in the tradable subcomponent. The declines in the nontradable part therefore should not be taken too seriously. Fortunately, they are relatively small and do not substantively affect the overall picture. We detail our methodology in Appendix A. Government at all levels is the largest employer in the nontradable sector and accounted for 22.5 million jobs in 2008. Employment in government increased by 4.1 million over the period. Well over half of the increase is attributed to local and state government – local education (+2,174 thousand jobs), local government/other compensation (+982 thousand jobs), and state government and educational services compensation (+629 thousand jobs). The Bureau for Labor Statistics (2009) expects government to continue to be a major contributor to employment over the next decade, with an expected 1.6 million additional jobs by 2018 (largely at the local and state level). Will their predictions come to pass? State and local budget crises across the country have put pressure on government employment, particularly in education. Although the 2009 stimulus helped delay teacher layoffs, reportedly saving 325 thousand jobs in education (Cooper and Nizon, 2009), the fiscal position of government at all levels remains precarious. We also note that government employment is not driven primarily by market forces. Its employment-generating capacity is therefore also in question. Health care is the second largest employer in the nontradable sector, with an end of period total of 16.3 million jobs. In terms of increments, health care's growth of 6.3 million jobs tops the list. Employment growth in the industry was largely driven by the offices of health practitioners (+1.5 million jobs), hospitals (+1.1 million jobs), and nursing and residential care facilities (+1.1 million jobs). The employment increases in government and health care combined produced almost 40% of the total net incremental employment in the economy since 1990. Market forces do operate in health care, but with large informational asymmetries and substantial public-sector participation on the demand side and in regulation. The expectation is that this industry will continue to grow as baby boomers age and require more medical services. Already, half of the 20 fastest-growing occupations are in the health-care industry, and more than 3 million jobs are projected to be added by 2018 based on Bureau of Labor Statistics, U.S. Department of Labor (2010) estimates, more than any single other industry. The number of in-home health-care aides alone is expected to rise by more than 50% by 2018. Still, the impact of government fiscal pressure on the health-care industry remains to be seen. The tradable part of the economy presents a different picture. Employment in different industries shows increases and declines, which net to a positive but small number. Table 2 shows the changes in the tradable sectors, including manufacturing, which is split into three groups. Manufacturing I includes food and apparel; Manufacturing II includes wood, chemicals, and cement; and Manufacturing III includes metal products, machinery, and semiconductors. For a full product list of each group, see Appendix B. In Manufacturing III, we isolated electronics, autos, and other transportation (aero, rail, and naval) to get a closer look at these industries. In Manufacturing II, we isolated pharmaceuticals. The pattern is mixed but clear. The manufacturing sectors declined substantially in employment in all three groups. Manufacturing III (including electronics, auto, and other transportation) is both the largest employer in the tradable sector – a total of 7 million jobs in 2008 – and accounts for the largest drop in jobs between 1990 and 2008 (−2.2 million) (see Table 2). Major industry job loss can be attributed to the electronics industry (−650 thousand), aerospace (−337 thousand), and the auto industry (−172 thousand). Manufacturing I accounts for the second-largest drop over the period (−1.3 million). In this sector, major industry job loss came from cut-and-sew apparel manufacturing (−597 thousand) and fabric mills (−203 thousand). Manufacturing II accounts for the third-largest drop (−880 thousand), driven by the paper (−438 thousand) and chemical industries (−166 thousand). Agriculture also posted losses of 535 thousand jobs. Parts of agriculture are highly capital intensive but others (like fruit and vegetables) remain labor intensive. The most notable increases in major tradable industries were in finance/insurance (+728 thousand) and in architectural and engineering services (+497 thousand). Job growth in the finance/insurance industry was driven by securities, commodity contracts, and other financial investments (+300 thousand jobs), monetary authorities, credit intermediation (+230 thousand jobs), and brokerage agencies (+130 thousand jobs). The tradable portion of information – the telecommunications, data hosting, broadcasting, motion picture, recording, and publishing subindustries – rose overall, but experienced a sharp rise and fall during the Internet bubble. Among the smaller tradable industries, computer systems design experienced the most striking growth, with a temporary reversal around the end of the Internet bubble. Off a base of 468 thousand jobs, employment growth yielded just over a million incremental jobs in the past two decades, driving employment growth in the professional services sector (the largest contributor to increases in employment growth over the past two decades in the tradable part of the economy). A large portion of the employment in the computer systems design industry falls under computer software engineers and systems analysts, both skill-intensive fields – one of the United States’ strong points. Although the record is promising, there is reason to worry about the sustainability of this industry. Companies have begun to shift a portion of software research and development operations abroad. As early as 1995, Microsoft established R&D facilities in China. Since then, it has ramped up its software development pursuits in the Asia-Pacific region; in 2008, the company announced its intention to invest more than US$1 billion in further investments. And the trend in software is replicated across the rest of the tech industry; Asian countries such as India and China far outpace the United States in growth of R&D investment. 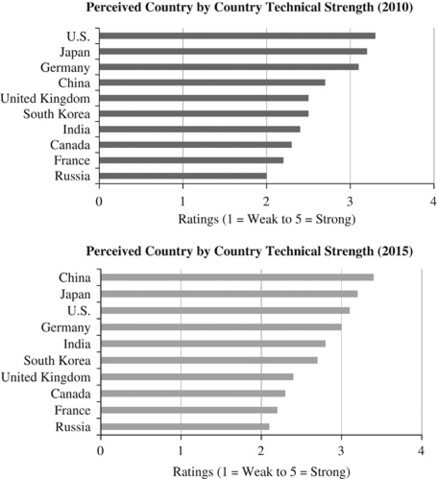 In its 2010 survey, R&D Magazine found that participants still view the United States as the most ‘technically strong’ country, but expect that to change in the next 5 years as both China and Japan overtake the US (see Figure 4). Management, scientific, and technical consulting (+799 thousand) along with accounting and tax preparation (+277 thousand), and business support services (+316 thousand) also showed impressive employment gains. Interestingly, pharmaceutical employment rose (+84 thousand), counter to the trend in much of the rest of manufacturing. Mining declined and then rose for a modest net gain overall. This is probably driven by the pattern of general commodity prices, which first fell and then rose as growth in emerging markets drove prices up. In summary, service producing, rather than goods producing, industries have driven employment growth over the past two decades, with the nontradable service sector accounting for the vast majority of new employment. On the nontradable side, government and health care are unlikely to continue generating employment at their pre-crisis rates. On the tradable side, we remain competitive in the key drivers of new employment (eg, computer systems design, consulting, and finance and insurance) but we face rapidly expanding competition from emerging markets. If a company performs a service internally at one point in time, and then at a later point purchases the service from an outside source then the value added of the company (other things equal) falls because a service has been created outside – value added becomes a purchased input. Similarly, when a domestic industry moves some part of the supply chain to another country, the value added in the outsourcing country will fall, even though the final sales of product may remain the same. In short, value added can decline either because the industry is in decline or because more of the value added is created by different companies, countries, or both. We call it outsourcing when the function is performed by another company and off-shoring when the function is performed in another country. Clearly, offshoring is possible without outsourcing (a multinational company moves the activity to another country but continues to perform the function itself), as is outsourcing without offshoring (the function is performed domestically but by another company), as is offshore outsourcing.5 All elements of this grid can be found in advanced economies and in the global economy. One can put the employment and value-added data together and look at value added per person employed (VAP), in the economy as a whole, in the tradable and nontradable sectors, and industry by industry. VAP correlates closely with income. The evolution of the economy suggested by the employment data is really quite different from that painted by the value added and value added per job data. The methodology employed here is similar to that for employment. Value added and VAP are allocated to the tradable and nontradable sectors. Figure 5 depicts the value added in the economy in constant 2005 dollars for the tradable and nontradable sectors. Total value added is close to the GDP of the economy. Valued added in the tradable and nontradable parts of the economy grew at similar rates. In fact, the tradable sector, though smaller than the nontradable, grew slightly faster and hence marginally increased its share of total value added, in marked contrast to the employment trends. 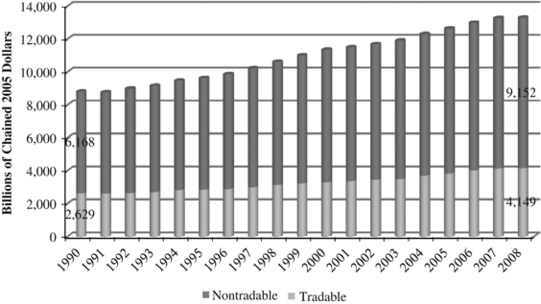 In 1990, VAP in the tradable and nontradable sectors was rather similar, with the tradable sector at almost $80 thousand, roughly $10 thousand above the nontradable figure (see Figure 6). But the VAP on both sides diverged slowly during the 1990s and then rapidly after 2000. VAP in the tradable sector grew at an average of 2.5% per annum, and the nontradable sector VAP grew at an annual average of 0.7%. By 2008, VAP in the tradable sector, at $121 thousand, was just over 50% above that for the nontradable sector, at $80 thousand. As noted, there are two kinds of sectors in the tradable category. In manufacturing supply chains, the lower value-added components go offshore. These chains saw declines in employment and rising value added, which implies a sharply rising pattern of value added per employee. In the second kind, employment and value added increased together. These tend to be high-end services in which the US economy continues to enjoy a competitive position or better. In this set of sectors, one would not know in advance, by the logic and arithmetic, whether VAP would rise or fall. In fact, VAP seems to have risen in most of them. These are growing sectors where both value added and VAP are increasing together; here, the value added chain is not (or not yet) migrating to other parts of the global economy. Table 3 depicts the trends in value added in the industries of the nontradable part of the US economy. The real estate, rental, and leasing industry grew from a $1.0 trillion in 1990 to $1.7 trillion by 2008, a 63% increase. Real estate, rental, and leasing are a rising employment industry and a substantial one (accounting for 2.6 million nontradable jobs in 2008), but its growth in value added exceeded its job growth, resulting in a rise in VAP of 32%. Postcrisis, it has undoubtedly decreased in both number of jobs and value added. As before, government is large – a base of $1.4 trillion in 1990 – and expanding, with a 17% increase in value added from 1990 to 2008. 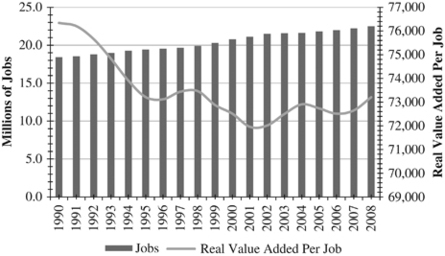 However, employment outpaced the rise in value added, resulting in a decrease in value added per job of 4% from 1990 to 2008, see Figure 7. After a drop in VAP in the early 1990s, since 2000 VAP has effectively stagnated (an average of $73 thousand). One reason for the stagnation is the relative insulation of the government sector from the price effects of excess labor supply. Off a base of $597 billion in 1990, health care increased in value added by 50%, but its VAP decreased by 9% from 1990 to 2008. However, the trend in VAP since the late 1990s has been upward as medical-care providers such as hospitals improved their profit margins behind increased bargaining power with insurers, moderating expenses, the provision of more high-cost services (eg, cardiac surgery), and strong returns on stock market investments (Appleby, 2006), see Figure 8. Construction's value added increased by 6%, off a base of $519 billion. The industry's value added peaked around 2000, earlier than its 2006 peak in employment. Over the full period, VAP declined by 18%. As mentioned earlier, the large employers in the nontradable sector are government, health care, and construction. The dominance of the three industries in employment coupled with declining VAP resulted in modest VAP growth (about 0.7% per year) in the aggregate nontradable sector. Moreover, government and health care employ large numbers of workers in the mid-range of the income distribution. Declining VAP in these sectors has had the effect of depressing middle-income growth and increasing income inequality, as the high end rose faster. Both retail (+83%) and wholesale (+146%) value added grew off bases of $383 and $310 billion, respectively. Wholesale trade's VAP expanded very rapidly in the 1990s, reflecting dramatic increases in productivity and flat employment growth. According to a 2002 Bureau of Labor Statistics study, the industry's productivity boom was caused by three factors: improvement in technology, specifically the introduction of systems such as the Electronic Data Interchange; Internet communication to buy and sell products; a rapid expansion in the size of wholesale businesses; and the adoption of new business models (Kask et al., 2002). Accommodation and food (hotels, restaurants, and food service) also grew in value added, but what is perhaps striking is its relatively small size in value compared with its share of employment: in 2008; the industry accounted for 10% of jobs in the nontradable sector, but only 4% of nontradable value added. Moreover, the industry's VAP level is also low, at $31 thousand in 2008. Administrative and support services also has a low VAP of $37 thousand. Even when discounting for part-time work, the figures are low. Moreover, accommodation and food service are high and rising employment sectors, so their low VAP further explains wage stagnation. Education (–20%), legal (–10%), and other services (–9%) experienced declining VAP from 1990 to 2008. A possible reason for the declining VAP in these nontradable sectors is the wage effect of increased competition for nontradable jobs, since jobs in the tradable sector were flat and the employed population continued to grow. Utilities as a group are capital intensive and rising labor productivity may be related to increased capital intensity and to IT advances that automate some of the control systems. Its VAP rose by 49%. Information, finance, and insurance are largely tradable; here we are seeing mainly tradable gains reflected on the smaller nontradable side. The most interesting data concern the value-added trends in the tradable part of the economy. The tradable sectors (shown in Table 4) deserve careful scrutiny. One might have expected that the trends in value added would be similar to those for employment, some rising and some declining. But, in fact, the pattern is mostly increasing value added across industries. Parallel with increases in employment from 1990 to 2008, tradable value added also increased in finance and insurance (+76%, base of $434 billion); miscellaneous professional, scientific, and engineering services (+79%, base of $345 billion); and information (+150%, base of $155 billion). But the manufacturing sectors, where employment declined, all show increases in value added – Manufacturing I, +9% off base of $203 billion; II, +32% off base of $402 billion; and III (excluding electronics, auto, aero, and naval), +18% off base of $320 billion. The only two sectors to register a decline were non-auto transportation (which includes aero, rail, and naval), with a decline of 17% off a base of $110 billion, and mining, with a decline of 39% off a base of $321 billion. Although the Bureau of Economic Analysis notes the difficulty of accurately measuring the finance and insurance industry over time, it was already a well-established service sector at the beginning of the period, accounting for 7% of national real value added in 1990 (8.4% in 2008).6 In the tradable sector, finance and insurance was the largest industry in value-added terms in 2008 and the second largest based on employment. The primary driver of the increase in value added for the sector was insurers, who accounted for an increase in value added of $187 billion from 1990 to 2008. While both employment and value added were increasing in finance and insurance over the period, the increase in value added outpaced that of employment, resulting in a 46% increase in value added per job (see Figure 9). Given the widely cited troubles in the finance and insurance industry during the past few years, it remains to be seen whether the sector can return to its previous growth trajectory and how the current efforts at regulatory reform might impact future industry development. What is clear is that this industry will play a central role in allowing the US to regain growth momentum. The drop in employment in the non-auto (aero, naval, and rail) transport equipment industry was enough to offset the drop in value added, resulting in a positive increase of 22% in value added per job over the same period (see Figure 10). To a large extent, the decline in aerospace value added reflected falling military procurement after the end of the Cold War. However, since 2003, the industry has been rebounding behind multi-front military activities, and both employment and value added are on the rise. Value added has grown more than 30% since 2003 alone. Notably, the United States had a trade surplus in the aerospace industry in 2009, $47.2 billion, up 6.3% from 2008 (International Trade Administration, 2010). According to the International Trade Administration, the surplus in aerospace was the largest among all US manufacturing industries. It is the result of the top end of the value chain being in the United States, accurately reflecting the global configuration of the supply chain. This is the direct analog of China's apparent surplus in electronics, which results from the assembly piece of the value-added chain being performed substantially in China. Whether the positive trends seen in recent years continue will depend in part on foreign policy decisions. Given the publicity surrounding the US auto industry's struggles, the observed increase in value added (+95%, base of $58 billion) may appear at odds with expectations. However, as employment has fallen, the production portfolio of the US Big Three automakers has changed – by 2005, despite losses of market share in cars, US car companies still led in sales of light trucks. According to a congressional report, in 2003, GM production was 64% in trucks (the opposite of its 1990 ratio of cars to trucks); that same year, Ford produced 74% trucks and Chrysler almost 80% (Cooney and Yacobucci, 2005). The increase in value added can be attributed to the increase in sales of light trucks relative to cars: one analyst estimates that GM makes four times the profit from the sale of an SUV compared to a small car (Bensinger, 2008). The increase in value added per job is higher than the increase in gross value added because of the drop in employment, with a 133% increase from 1990 to 2008 (see Figure 11). To be sure, the employment losses in the auto industry are disappointing. However, given the oft-heard dismal statistics about the decline of the US auto industry, the rise in auto's value-added contribution over the past 20 years is welcome news. After all, by 2003, the majority of cars sold in the domestic market were from US-based foreign manufacturers (eg, Toyota's plant in Kentucky) or were imported; whereas in 1979, Ford, General Motors, and Chrysler sold eight of every ten cars in the United States (Cooney and Yacobucci, 2005; Orakzai, 2006). In addition to a shifting production portfolio, the marked increase in value added since 2000 indicates that American car companies started rising to the challenge of competing in the global environment before the Great Recession. The challenge for the industry will now be finding a way to continue increasing value added per worker while increasing, or at least maintaining, employment. On the basis of reported figures from the White House, it seems that the industry, thanks to the direct intervention by the government, has done just that: from mid-2009 to mid-2010, the industry gained more than 50 thousand jobs in addition to recording profits for the first time since 2004 and increasing exports abroad (The White House, 2010). Switching to the smaller value-added sectors, the computer systems design industry presents an ideal combination, with both growing employment and growing value added, although it comes off a small base of $36 billion. The industry has the second highest increase in value added, an estimated 371% rise from 1990 to 2008 (see Figure 12). The parallel increase in employment and value added resulted in an overall increase in value added per job of 39% from 1990 to 2008. The industry's growth was severely dampened by the dot.com bust in the early 2000s, but it has since rebounded in both value added and jobs. But the largest increase in value added occurred in electronics (+3683%), which is a declining employment sector. The explosive growth in electronics sales and value added is not a surprise given the growth in demand for computers, cell phones, and many other devices that connect to the Internet. Because of the perception that the United States’ competitive edge lies in its ability to develop and leverage innovation, the electronics industry is often used as a main indicator for the overall competitiveness of the US tradable sector. And, unlike other industries, electronics receives especially widespread attention because of its pervasive presence and impact in the lives of so many. Declining employment in electronics in the United States, despite the high growth in value added, is explained by the offshoring of a growing number of parts of the value-added chain, ranging from labor-intensive assembly to semiconductor manufacturing and design, and even to product development. So here we have the classic case: industry growth is high and value-added growth is high because the high value-added portions of the supply chains have remained in the domestic economy. Meanwhile, the lower value-added portions migrate offshore, explaining declining employment. 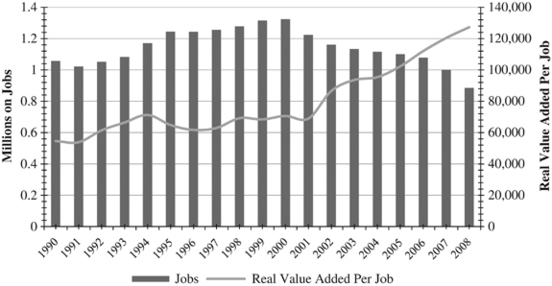 The dual impact of falling employment and increased value added resulted in a 5640% increase in value added per job from 1990 to 2008 (see Figure 13). Of course, the low VAP in 1990 needs to be put in proper context; its extremely low level is a statistical artifact, reflecting the construction of the real value-added data using 2005 as its benchmark. Early consumers of personal computers will recall the exorbitantly high prices of electronics in the early 1990s by today's standards; since then, prices have fallen dramatically year after year. Costs fell with them (for comparable amounts of computing power), the economic effect of the operation of Moore's law. Basically, the value-added data do not reflect what consumers actually paid for the products in the early years. For perspective, the nominal VAP in 1990 was roughly $52 thousand, far above the real VAP of roughly $4 thousand. Still, even without the effect of Moore's law on the real value-added data, the rise in VAP is large. As a paragon for geographic shifts in value chains, the labor-intensive aspects of the electronics production have steadily moved offshore to lower-cost regions, particularly Asia. As these jobs have shifted abroad, the domestic industry has become far more concentrated in skill-intensive aspects of the value chain (eg, design). The results from the ability of the industry to pursue the most cost-efficient means of production are clear; even at the height of the recession, electronics companies continued to post profits. Industry standouts such as Apple Inc. escaped seemingly untarnished – in October 2009, the late CEO Steve Jobs was quoted saying, ‘Recession? What recession?’ as his company continued to break its previous profit records. To summarize, in some sectors – largely services – the US economy continues to have a comparative advantage. In them, employment and value added grew together. But in other classes of industrial or manufacturing sectors, value added rose and employment declined. The explanation for this pairing in the context of the global economy and the shifting characteristics of the emerging economies is not hard to uncover. Parts of the value-added chain in these industries are moving to other countries, prominently the emerging economies. The parts that are moving are those with lower VAP. As the emerging economies grow and mature, competition will move up the value-added chain. This has been going on for some time. In summary, over the past 20 years in the US economy, some parts of the tradable sector grew in value added and employment (eg, the finance, insurance, and computer systems design industries), whereas others grew in value added but declined in employment (eg, the electronics and auto industries). The former are where most of the value added chain is in the upper range in terms of value added. The latter are sectors, such as manufacturing, with a range of value-added components. In these, the lower value added portions moved offshore, causing a decline in employment and leaving behind the higher value added parts. These higher valued added segments of industries remain competitive and thrive by operating in a global economic environment with access to high-growth emerging market economies and expanding commercial and business opportunities. Overall, the tradable sector generated negligible incremental employment. Yet the economy did not have a conspicuous unemployment problem, at least until the crisis of 2008. The expanding labor force was absorbed in the nontradable sector (roughly 26.7 million net new jobs), with government and health care leading the growth (10.4 million incremental jobs between them). In our view, it is unlikely that this pattern will continue. Chances are good that the pace of employment generation on the nontradable side will slow. Moreover, incomes in the nontradable sector have been stagnating for years. Fiscal conditions, the costs of the health-care sector, a resetting of real estate values, and the elimination of excess consumption all point to the potential for a longer-term structural employment problem. Expanding employment in the tradable sector almost certainly has to be part of the solution. Otherwise, the United States will have a longer-term employment problem. MARKET FAILURE OR DISTRIBUTIONAL ISSUE? In describing these trends, we have been asked several times what the nature of the market failure is. The answer seems fairly clear. There is no major market failure in the way economists normally use the term. Multinationals, businesses that operate in the global economy, and those who have a role in creating and managing global supply chains are good at what they do and are getting better all the time. They are knowledgeable about doing business in multiple national environments (an important capability). They identify and respond to growing market demand, especially in the emerging economies, and to evolving supply chain opportunities. The transactions costs of complex and geographically disperse supply chains are coming down because of a combination of management expertise and IT that allows efficient coordination of complex, geographically dispersed systems. The costs of remoteness are declining; or as Thomas Friedman would say, the world is becoming more flat. The global economy has an abundance of human resources and they are becoming more accessible as time goes on. As the emerging economies develop, they deepen in human capital and skills. The portions of the supply chain in which these economies have the potential to be competitive are growing. Multinational companies, which operate in a way that gives access to these assets and to growing markets, are doing exactly what one would expect them to do. The resulting efficiency of the global system is high and rising. So, there is no market failure. The system is complex and constantly evolving, but the operatives in the system adapt to the shifting sands of comparative advantage and market size, and move economic activity (think of parts of the value-added chains) to the places where it can be performed at high efficiency and low cost. If the issue is not about efficiency or market failure, what then is the problem? The answer is that market forces have distributional consequences in employment opportunities and incomes. Subsets of the world's population, including those within individual countries, may experience adverse effects. One way to think about it is that global markets are becoming more integrated in tradable sectors and functions, whereas before they were separated geographically by high transactions costs and policy barriers. When markets merge, or partially merge, there are effects on prices, wages, and incomes. Some rise and others fall. Not everyone is happy. This seems fairly clear in the US economy. The most educated, who work in the highly compensated jobs of the tradable and nontradable sectors, have high and rising incomes and interesting and challenging employment opportunities, domestically and abroad. Many of the middle-income group, however, are seeing employment options narrow and incomes stagnate. Recent surveys suggest that people have doubts about the opportunities available for future generations. This may be pessimism induced by the tremendous shock of the crisis, high unemployment, and a difficult recovery – but it appears that the declining employment opportunities in the tradable sector for middle-income employees predate the crisis. Uncertainty about both the quantity and quality of the employment opportunities for this group is considerable. During the postwar period, the distributional effects of globalization were largely benign, but we now appear to be at crossroads. The major emerging markets, and the developing countries more broadly, are collectively, and in some cases (such as China) individually, systemically important, in terms of both macroeconomic and financial stability and the effect they have on the structure of other economies. Many of those effects are positive. Consumer goods, for example, are less expensive than they would be in a less open environment. But the distributional effects may be negative. Within countries, inequality may rise. Between countries, the success of the emerging economies may impose costs on richer ones, straining public support for globalization. One possible response to these trends would be to assert that market outcomes, especially efficient ones, always make everyone better off in the long run. That seems clearly incorrect and is supported by neither theory nor experience. It is true, as in the United States, that many goods and services are less expensive than they would be if the economy were walled off from the global economy, and that the benefits of lower prices are widespread. But these cost savings do not necessarily compensate for diminished employment opportunities, and it would be presumptuous in the extreme for policymakers to tell voters and citizens what their values and preferences should be. People might trade cheaper goods for assurances that a wide range of productive and rewarding employment options would be available, now and in the future, for themselves and their children and grandchildren, even if the cost of goods they consume were to rise. A second position acknowledges the distributional effects. If we want to use the market system in the context of an open global economy, distributional implications are inevitable, but we have to accept them. Why? Because, the argument goes, the alternative is not having an efficient market system operating in a relatively global open economy, which would be far worse. However much one might wish otherwise, it is impossible to fully compensate those whose employment opportunities or incomes are adversely affected. This stance is more realistic than the first one. There probably are real choices between aggregate income levels and efficiency on the one hand, and distributional equity and employment opportunities on the other. But, to complete the assessment, one needs to explore policies that may improve the trade-off. In principle, one could restrict access to the domestic market by foreign suppliers. This generally falls under protectionism, risks reciprocal action, and sets in place an escalating pattern almost certain to cause more harm than good. The G20 is right to caution repeatedly about widening protectionism. A preferable approach is to accept globalization but to look for domestic policies that will reduce the negative distributional impact at home. Admittedly, no simple policy fix will achieve this. Addressing inequality is a complex challenge; almost certainly, a multipronged approach will be needed. But the challenge should not be ducked, because the availability of quality employment and the rising gaps in income distribution are politically salient issues. The absence of rewarding employment opportunities in the lower- and middle-income ranges breaks an important part of the social contract in America, which holds that you are largely on your own but that if you work hard the opportunities will be there. The second part of that contract is now in question. The challenge, then, is to look for ways to counter these powerful forces: what, practically speaking, can be done to shift the evolving global structure in our favor without causing excessive damage to the overall system or to others? This analysis indicates that part of the answer must come from altering the trends in the tradable sector. Market forces operating in the global economy are powerful. It is not reasonable to define the challenge as resisting or overriding them. But the goal must be to shift incentives at the margin so as to improve the distributional effects in the US, favor. What follows is not meant to be a full discussion of policy options, but rather a suggestive starting point. On the supply side of labor markets, the state and individuals can invest in physical capital (infrastructure), institutions, human capital, and the knowledge and technology underpinnings of the economy. These investments generally have the effect, in advanced and developing countries alike, of raising the return to private investment, causing the latter to expand in scale and scope, and employment along with it. Next, Washington should continue to support fundamental research. The public-sector investment in knowledge and technology is large in the United States, and has been an important foundation for driving new technology, growth, and productivity. But, in some areas, given budget constraints and competing obligations, this investment is on the decline. Human capital is a by-product of the research investment, and many think that the by-product is as important as the direct knowledge output. It is also a good idea to explicitly target some of the public-sector investment at technologies with the potential to expand the scope of the tradable sector and employment. Coinvestment with the private sector, which has relevant knowledge about where these opportunities might be, would make sense and has already been suggested by private sector leadership.8 This public investment would have the effect of shifting private incentives so that they are better aligned with social objectives. Multinational firms operating in the tradable sector have access to abundant supplies of relatively low-cost labor in the global economy. In this kind of environment, the payoff to investing in capital-intensive technologies that increase labor productivity in high-income countries in the tradable sector is minimal. However, that incentive can be shifted somewhat with public-sector coinvestment that would lower the private sector's cost of investment. The shift of incentives would also expand the employability of domestic citizens in the tradable sector. Infrastructure should also be part of the portfolio. It directly adds employment and improves competitiveness and efficiency in a wide range of sectors. Given the difficult current fiscal situation, it will be hard to find the fiscal space to expand investment in these areas; exploring public–private joint ventures to build or upgrade infrastructure may therefore be a useful avenue. There is a growing body of experience with the public–private partnership approach to infrastructure in developing countries, which often want to accelerate infrastructure investment to support growth, but which have limited and constrained fiscal resources. Recovering manufacturing activity that has departed will not be easy. Manufacturing competitiveness is supported by skilled labor and by training and technical institutions. Once these institutions are gone, it is difficult to get them back.9 One implication is that long-term policy should include an evolving assessment of competitive strength and employment potential across sectors and at all levels of the human capital and education spectrum, and a goal of steering or nudging market outcomes to achieve the social objectives. The structural evolution of the economy matters and can be influenced in relatively efficient ways. This recommendation is not as radical as it may sound. Despite much comment to the contrary, the sharp line between intervening to influence market outcomes over time and a hands-off approach is an illusion. Most countries (advanced and developing) adopt policies and invest public resources in assets that increase human capital, the technological base of the economy, and its competitiveness. That will and should continue. It is a benign form of competition among nation states, which increases productivity everywhere, provided that the markets for final and intermediate goods and services remain open. The alternative is to use more blunt and destructive forms of intervention, generally falling under the heading of protectionism. And the incentive to resort to that kind of ‘solution’ increases as the distributional effects on employment opportunities and incomes become more adverse. Although most of the heavy lifting on these issues of structural change, diversification in the tradable sector, and distribution needs to be carried out at the national level, certain dimensions are international as well. If a relatively open global system is going to survive in a world in which nation states are the principle decision makers with respect to policy then it will have to be managed and guided by a set of principles designed not just to achieve efficiency and stability (important as those are), but also to try to ensure that, as the system evolves, the benefits are spread equitably across countries and subgroups within countries. What is needed is an understanding of the distributional issues and their structural underpinnings and an ability to discriminate between destructive national policy responses, those that threaten the openness of the system, and those that are relatively benign in the sense of imposing limited costs on other countries. Although the World Trade Organization is the arena where rules are negotiated, the G20 is where the priorities and guiding principles for policy coordination are set. In the United States, it is hard to predict how these issues will be addressed as the economy evolves. Given the condition of local, state, and federal budgets, long-term public-sector investments in growth and employment are likely to be deferred. But the central unknown is how the employment situation will evolve. If employment bounces back with growth and if the trends reverse in the tradable sector, or the nontradable sector continues to have high absorptive capacity, then from a political point of view, the issue will be less important and the political support for an open global economy will be easier to sustain. This scenario does not seem to be the most likely one, and the postcrisis performance of the US economy is consistent with this view. Growth and employment are set to diverge. That divergence is quite clear in the domestic US data. It is also present in the global economy. In this kind of environment, politics will probably become divisive and polarized, and the inclination to use protection and market access to expand employment options will increase. Because that will undoubtedly provoke responses by other countries, the openness of the global economy will be at risk. Easy answers appear to be missing. Investing in hard and soft infrastructure with an explicit focus on employment is almost surely the right way to get started. But it is not possible to know in advance how effective this will be in expanding employment options. Experimenting is only the way to solutions. These structural issues deserve attention and debate sooner rather than later. A broad discussion involving policymakers, business, labor, universities and research institutes, and concerned social organizations is needed, in part because the knowledge required to create and evaluate possible responses is highly decentralized. Assuming that the markets will fix these problems by themselves is not a good idea; it may be approximately true for the global economy as a whole, but is not necessarily for its parts. In truth, most countries, including successful emerging economies, have addressed issues of inclusiveness, distribution, and equity as part of the core of their growth and development strategies. Now advanced countries will need to follow suit. Confronting the tension between efficiency and distribution and attempting to strike an appropriate balance is critical. The late Paul Samuelson once said that every good cause is worth some inefficiency. Morally, pragmatically, and politically that seems right. Delivering on the opportunity part of the social contract is one such cause. Our understanding of the dynamics of rapid developing country growth and the policies and investments that support it represent a vast area of learning from a growing body of experience and from research. It is much too large a subject to cover here. Spence (2011) has attempted to describe it in terms that are accessible. The divergence between value added per worker and average income per worker can occur as a result of difference in capital intensity across industries. But for industries with similar capital intensities, value added per person employed and average incomes will be quite close. With the exception of information, this industry was split based on its specific subindustries rather than on a proportional basis. For instance, software publishers were classed as entirely tradable, whereas newspaper publisher were classed as nontradable. See Appendix A for all of the splits for information. Many associate outsourcing with offshoring. But it is useful to remember that the early service outsourcing was domestic and involved moving service functions to locations where the availability of suitable labor was abundant and the costs relatively low. Due to the ongoing changes in financial accounting practices and a number of unpriced services (eg, transferring of funds and processing of checks), the financial services industry is classed as ‘difficult to measure’ by the BEA. For more details, see Mayerhauser (2009). According to the 2009 Program for International Student Assessment Test, a survey administered by the OECD that compares student performance across countries, American students not only scored below typically competitive countries (eg, Finland, Norway, Singapore, etc), the United States also was beat out by students in Shanghai (China). In December 2010, Ken Chenault, the CEO of American Express, suggested that the United States create a taskforce comprised of both public and private leaders to determine where the opportunities are for employment growth (Guerrera and Kapner, 2010). That is one of the reasons that competitive manufacturing in a wide range of industries is clustered, as documented in Porter (1990). The authors are grateful to the Leonard N. Stern School of Business and the Hoover Institution for support of this research. The analysis uses employment data from 1990 to 2008 from the Bureau of Labor Statistics, Office of Occupation Statistics, and Employment Projections. The data used for industry value added estimates are from the Bureau of Economic Analysis; value added data are in real terms, with 2005 as a benchmark. The industry classifications are based on the 2002 North American Industry Classification System. 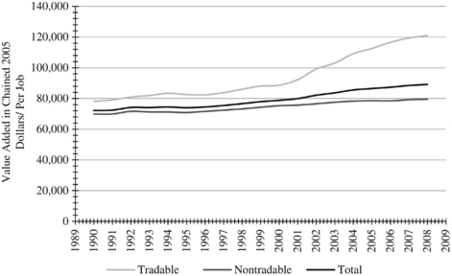 Industries were split based on Jensen and Keltzer's (2005) geographic concentration index, which measures domestic tradability and potential international tradability, a subjective assessment of whether domestically tradable industries are in fact internationally tradable. We used export/import data as a final check. For instance, legal services, though tradable domestically, are not very tradable internationally. The majority of industries are either wholly tradable or wholly nontradable. Take waste management; this sector is entirely nontradable due to the need for processing facilities (eg, landfills and treatment plants) to be nearby. On the tradable side, many service sector industries such as computer systems design are classed as entirely tradable since providing these services is not constrained by location or other barriers (eg, legislation preventing trade in design or engineering services across borders). The list of nontradable industries includes, but is not limited to, construction, transportation and warehousing, real estate, facilities support services, security services, accommodation, and food. Tradable industries include, but are not limited to, automobile manufacturing, agriculture, mined goods (eg, metals, coal etc), consulting, architectural services, and payroll services. For a complete industry-by-industry breakdown of tradability, see Spence and Hlatshwayo (2011). Although almost all industries were proportionately split, information was split based on specific subindustry sectors. For information, the following subindustries are tradable: telecommunications, data processing and hosting, software publishers, and motion picture, video, and sound recording industries. Nontradable information industries include newspaper, periodical, book, and directory publishers, and broadcasting (not including Internet broadcasting). Because of the difference in measurement between the Bureau of Economic Analysis and the Bureau of Labor Statistics, value added for the information industry was split based on the average proportional split in the employment data rather than on a subindustry-by-subindustry basis. Appleby, J . 2006: Hospitals’ profit margin hits 6-year high in 2004. USA Today, 4 January, http://www.usatoday.com/money/industries/health/2006-01-04-hospital-profits-usat_x.htm, accessed 12 January 2011. Bensinger, G . 2008: GM cuts truck production, adds no-interest financing (Update 2). Bloomberg.com, 23 June, http://www.bloomberg.com/apps/news?pid=newsarchive&sid=amf8CmBH40L0, accessed 15 January 2011. Bureau of Labor Statistics, U.S. Department of Labor. 2009: Employment projections 2008–2018, http://www.bls.gov/news.release/archives/ecopro_12102009.pdf, accessed 12 January 2011. Bureau of Labor Statistics, U.S. Department of Labor. 2010: Occupational outlook handbook, 2010–2011 edition: Healthcare; http://www.bls.gov/ooh/about/career-guide-to-industries.htm, accessed 22 January 2011. Cooney, S and Yacobucci, B . 2005: U.S. automotive industry: Policy overview and recent history (CRS Report RL32883). Washington DC: Congressional Research Service, http://www.ncseonline.org/NLE/CRSreports/05apr/, accessed 13 January 2011.
Cooper, M and Nizon, R . 2009: Schools are where stimulus saved jobs, new data show. New York Times, 30 October, http://www.nytimes.com/2009/10/31/us/31stimulus.html, accessed 5 January 2011. Guerrera, F and Kapner, S . 2010: Amex chief calls for jobs taskforce. Financial Times, 5 December, http://www.ft.com/cms/s/0/5b4322f8-009b-11e0-aa29-00144feab49a.html#axzz1BnhexIRt, accessed 20 January 2011.
International Trade Administration. 2010: Flight plan 2010: Analysis of the U.S. aerospace industry, http://www.trade.gov/mas/manufacturing/oaai/build/groups/public/@tg_oaai/documents/webcontent/tg_oaai_003732.pdf, accessed 12 January 2011. Kask, C, Kiernan, D and Friedman, B . 2002: Labor productivity growth in wholesale trade, 1990–2000. Monthly Labor Review, http://www.bls.gov/opub/mlr/2002/12/art1full.pdf, accessed 15 January 2011. Mayerhauser, N . 2009: Measuring the rapidly changing economy: Industry economic accounts. Presentation. BEA Advisory Committee, May, http://www.bea.gov/about/pdf/0509_presentation_measuring__rapidly_changing_economy.pdf, accessed 16 July 2012. Orakzai, T . 2006: US auto industry decline: Lesson from Ford and GM. American Chronicle, 4 July, http://www.americanchronicle.com/articles/view/11242, accessed 15 January 2011. Organization for Economic Cooperation and Development. 2009: Program for international student assessment (PISA) 2009 highlights, http://nces.ed.gov/surveys/pisa/pisa2009highlights.asp, accessed 20 January 2011. Spence, AM and Hlatshwayo, S . 2011: The evolving structure of the American economy and the employment challenge CFR Working Paper, Council on Foreign Relations: New York, http://www.cfr.org/industrial-policy/evolving-structure-american-economy-employment-challenge/p24366, accessed 16 July 2012. The White House. 2010: Rebuilding the American auto industry, http://www.whitehouse.gov/files/documents/20100729-autos-report-final.pdf, accessed 15 January 2011. Xing, Y and Detert, N . 2010: How the iphone widens the United States trade deficit with the people's Republic of China. ADB Institute Working Paper 257, Asian Development Bank Institute: Tokyo, http://www.adbi.org/workingpaper/2010/12/14/4236.iphone.widens.us.trade.deficit.prc/, accessed 16 July 2012.